The peak of summer is upon us, the days are hot, the produce is plentiful, and simplicity becomes my mantra. Refreshing rosés are my wine of choice, and cheese boards with savory nibbles, fresh fruit and vegetables become my outdoor dinner, enjoying the grandeur of nature and summer. This month the French Winophiles are hosting a virtual French Rosé Party. Thanks to Teuwen Communications for sponsoring our event by supplying some of us with three French Provencal rosés from Chateau de Berne. Chateau de Berne located in the hills of Provence on the Aurelian Way, a Roman road that once linked Italy and Spain. The estate is bordered by pine forests and lavender fields. The south-facing vineyards receive over 3000 hours of sunshine a year and cooler Provence nights for slow ripening grapes. 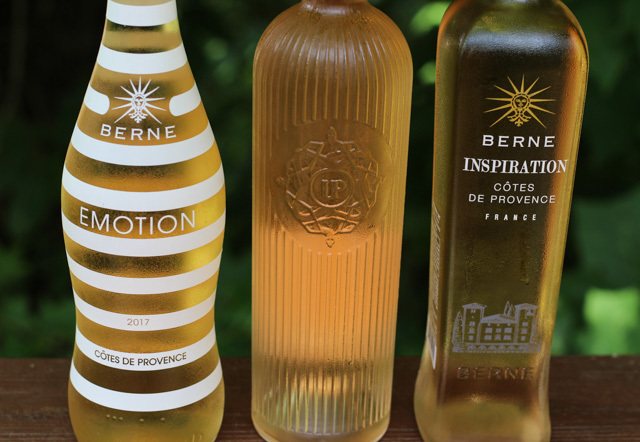 The contemporary and distinctive bottles are a nod to the light, and bright spirit found in Provence. Light pale salmon in color. Medium+ acidity and light+ body. Notes of red fruit; strawberries, raspberries, and cherries with a salinity finish. Bright pale salmon in color. Low+ acidity and light/medium body. Notes of red cherries, herbs, and minerality with a hint of white pepper. A smooth full lingering mouth feel. Light pale salmon in color. Low/medium acidity and body. Notes of cherries, strawberries, herbs, and lime zest. La Tur, a blend of cow, goat, and sheep milk with a creamy texture and tangy, yeasty, fruity flavors served along side cherries and figs. Melon wrapped in prosciutto with crisp Persian cucumbers and Marcona almonds. Top right corner, Caved aged Gruyere, made with cow milk. Dense creamy, earthy with fruity lactic notes. Bottom right corner, Chèvre balls rolled in red pepper flakes and garlic, made with goat milk. A fresh tart creamy cheese. Bottom left corner, Pyrennes Brebis, made with sheep milk. Floral notes with a hint of sweetness and nutty undertones. Top left corner. Mimolette, made with cow milk. Salty, nutty, and caramelly flavors. 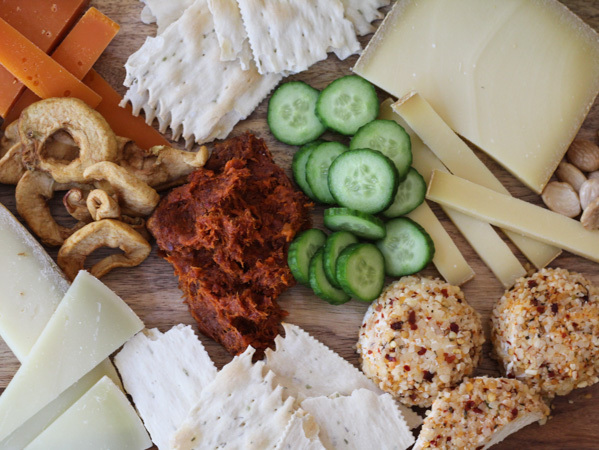 Also on the cheese board dried apple rings, Nduja (a spicy prosciutto spread), Persian cucumbers, Marcona almonds, and crackers. My favorite pairings with the rosé wines were the La Tur with cherries and figs, melon with prosciutto, Gruyere, Chèvre balls, and Pyrennes Brebis. The Nduja was too spicy and overwheming for the rosés. Robin from Crushed Grape Chronicles shares her vision of Côtes de Provence through Rosé Filled Glasses. Mardi from Eat Live Travel Write goes From Rosé? No Way! To # RoséAllDay. 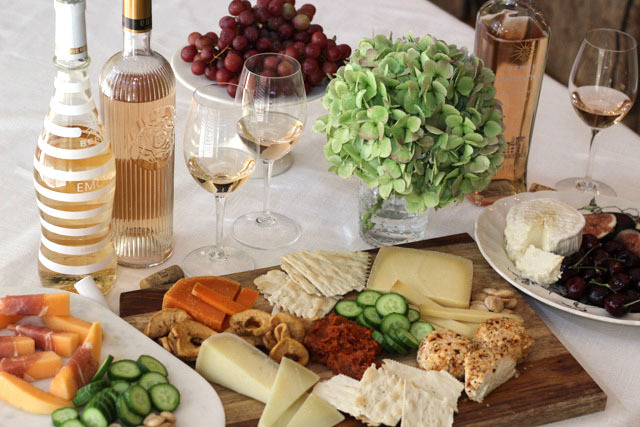 Camilla from Culinary Adventures with Camilla shares Warm Weather Rosé and Cheese Pairings. Michelle from Rockin’ Red Blog will be Celebrating the Provençal Lifestyle with Three Rosés. Lynn from Savor the Harvest cues up Obscure French Rosé to Look for Today. Gwendolyn from Wine Predator gives us a two-part treat: # RoséAllDay with Grilled Cheese Gourmet for #Winophiles and It’s Summer! Time for Rosé Wine from Provence, France and Seafood Pasta. Nicole from Somm’s Table adds Cooking to the Wine: Ultimate Provence Urban Rosé with Herbed Sous-Vide Chicken Breasts and Roasted Eggplant Sheet Pan. 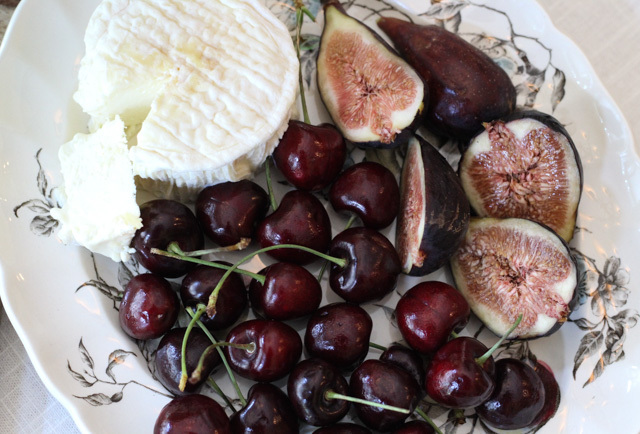 Jane from Always Ravenous offers up a Summer Cheese Board with Rosé. David from Cooking Chat says it’s Always a Good Time to Sip Provence Rosé. Jill from L’Occasion explains Why Rosé Matters, According to French Culture. Liz from What’s In That Bottle advises us to Live a More Rosé Life. Martin from Enofylz Wine Blog discusses The Pleasures of Provençal Rosé #Winophiles. Payal from Keep the Peas will share Rosé: The Original Red Wine. Julia from JuliaConey.com talks about Rosé: Not from Provence but Just as Delicious! Wendy from A Day in the Life on the Farm tempts us with Soupe au Pistou Paired with Rosé. And, here at The Swirling Dervish, we’re Celebrating Our New Home with an Old Friend: Rosé from Provence. What a fabulous post! Your photos are positively gorgeous and I am going to adopt the summer cheese board as a summer dinner option – WITH Provencal rosé of course! Thank you! Cheese board dinners with wine are truly one of my favorite dinners. (especially in the summer with rosé from France. Now that is my kind of dinner, Jane! Your cheese board looks beautiful and delicious. Perfect for the wines! A simple dinner is sometimes the best. Your photos are just beautiful, you may have inspired me to find some flowers for the house and to pull out a tablecloth and some of the fine china. And your cheese boards…inspiring selections and flavors and beautiful photos. We tasted these rosés and I found you couldn’t go wrong with melon and prosciutto with any of them. I have never heard of Nduja, but a spread made of prosciutto sounds amazing! Do you purchase this pre-made or is there a recipe and history you can share? Flowers in my house just makes me happy! 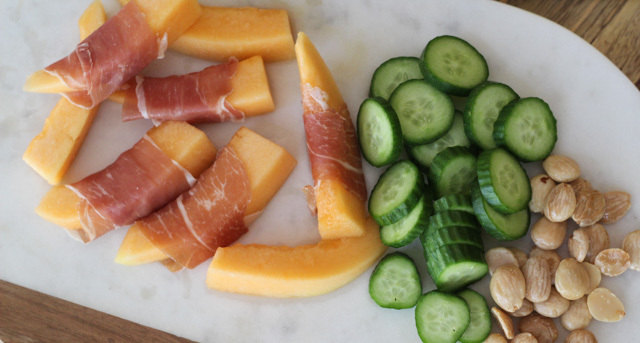 I agree the melon and prosciutto were a winning pairing with all three rosés. The Nduja I get at Whole Foods in the cheese department, it does have a spicy kick. But yes, buy some flowers and get out the nice china and enjoy some food and wine! Beautiful cheese tray! Thanks for the baked ricotta reminder… I’m going to make that instead of baked Brie for our after dinner cocktail party tonight! I love figs, it’s such a short season but I’m sure the pairing was perfect. I always love your pairings, Jane, but this month you’ve outdone yourself! The photos are gorgeous, with all the good things of summer on display. You’ve inspired me to head to the closest farmers market – now I just need to find out where that is! I love your cheese board idea for summer Jane! And rosé is the perfect wine! Cheers! Jane your pairings look delicious. Well done!